U2 seem to be something of a marmite band, to say the least. As I’ve said before, I can understand that. But one or two songs seem to rise above that and have become bona fide classics. Beautiful Day is, I would say, in that category. 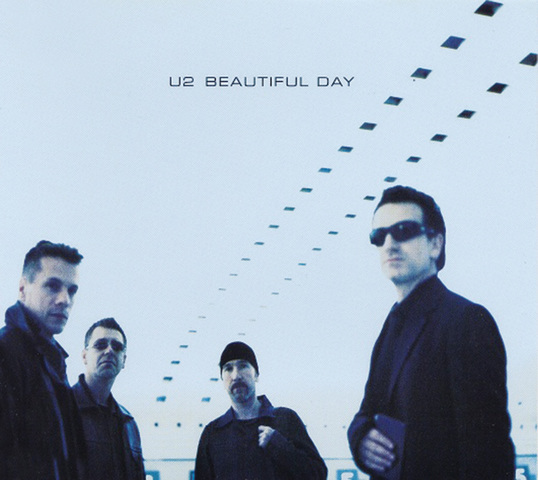 Beautiful Day was the first track from the band’s 2000 album All That You Can’t Leave Behind. In many ways the song was a throw-back to the sound of their early days, coming as it did after the band’s adventures during the 1990s which saw them embracing a more contemporary, radical sound influenced in part by the electronic and dance-culture of the day. It was a move that the band were wary of and debated for a long time before finally convincing themselves it was a good thing. In reality, whilst clearly echoing that early sound, the song wouldn’t have been what it was without the band having been through those 1990s – the electronics, textures, drumbeat, whilst more subtle, are clearly an extension of that experimentation. Lyrically the song is a little ambiguous, a not uncommon trait amongst the bands songs, living at that intersection of spirituality, romance and self-help, and has been described by Bono as being about “a man who has lost everything, but finds joy in what he still has”. Whatever the specifics of the lyrics, though, this is clearly a song designed (some might say cynically so) to uplift, and for me it does that in spades. Over the years Beautiful Day has established itself as a classic, reaching number 1 in many countries, garnering three Grammy awards in 2001 (including both song and record of the year), and becoming something of a mainstay for TV sport highlights. The song has been played at every U2 concert since. Note that if you struggle with all of the main riff, you can get away without the [Bm7][D] chords. Categories: Rock | Tags: 2000, 2000s, Rock, U2, ukulele | Permalink.